Accrington Stanley were denied potential victory in the goalless draw with AFC Wimbledon when they had a goal chalked off on the half-time whistle. Stanley, who also had goalkeeper Ross Etheridge sent off, thought they had gone ahead when Billy Kee fired in, but referee Trevor Kettle ruled it out. Lyle Taylor had a shot easily saved by Etheridge for the Dons, and Connor Smith also hit the post. Etheridge was dismissed for handball late on in the game. The draw lifts the home side into the top seven on goal difference, while Stanley stay fourth. Another famous example of referees blowing time while a goal was about to be scored was seen in the 1978 World Cup when Zico of Brazil saw his effort against Sweden disallowed after Welsh referee Clive Thomas blew the full-time whistle. "Credit to our boys. It's a good point. We didn't create bundles, we weren't brilliant by any stretch of the imagination. "Accrington are a very open, free-flowing team and they've carved a lot of teams open this season. "It's a boost for the lads to be in the play-off places but it's about where we are at the end of the season." "I'm delighted with the way we played but sometimes the luck doesn't go with you. "I've never seen anything like it happen [the disallowed goal] in all my 46 years playing and managing. "He blew as the ball was on its way into the net. You can't account for that. Everyone in the ground is flabbergasted. Referees make mistakes because they're only human and that's what makes the game of football so special because you have talking points and arguments." Match ends, AFC Wimbledon 0, Accrington Stanley 0. Second Half ends, AFC Wimbledon 0, Accrington Stanley 0. Matt Crooks (Accrington Stanley) is shown the yellow card. Ryan Sweeney (AFC Wimbledon) is shown the yellow card. Barry Fuller (AFC Wimbledon) is shown the yellow card. Barry Fuller (AFC Wimbledon) wins a free kick in the defensive half. Attempt blocked. Jonathan Meades (AFC Wimbledon) right footed shot from outside the box is blocked. Attempt saved. Adebayo Akinfenwa (AFC Wimbledon) header from the centre of the box is saved in the top centre of the goal. Attempt saved. Lyle Taylor (AFC Wimbledon) right footed shot from outside the box is saved in the bottom left corner. Substitution, Accrington Stanley. Jason Mooney replaces Shay McCartan. Ross Etheridge (Accrington Stanley) is shown the red card. Hand ball by Ross Etheridge (Accrington Stanley). Jonathan Meades (AFC Wimbledon) is shown the yellow card for a bad foul. Foul by Jonathan Meades (AFC Wimbledon). Liam Wakefield (Accrington Stanley) wins a free kick in the defensive half. 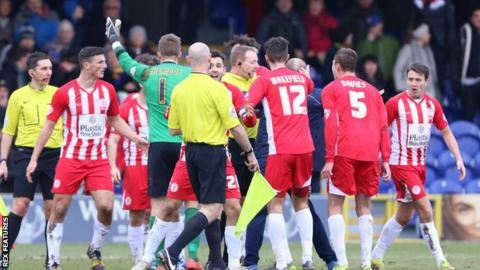 Sean McConville (Accrington Stanley) is shown the yellow card. Corner, AFC Wimbledon. Conceded by Matty Pearson. Connor Smith (AFC Wimbledon) hits the left post with a left footed shot from outside the box. Corner, AFC Wimbledon. Conceded by Sean McConville. Ryan Sweeney (AFC Wimbledon) wins a free kick in the defensive half. Attempt saved. Jake Reeves (AFC Wimbledon) right footed shot from outside the box is saved in the bottom left corner. Attempt saved. Shay McCartan (Accrington Stanley) right footed shot from outside the box is saved in the bottom right corner. Substitution, AFC Wimbledon. Dannie Bulman replaces Andy Barcham. Substitution, AFC Wimbledon. Adebayo Akinfenwa replaces Tom Elliott. Attempt saved. Seamus Conneely (Accrington Stanley) right footed shot from outside the box is saved in the centre of the goal. Attempt missed. Tom Elliott (AFC Wimbledon) right footed shot from outside the box misses to the left. Foul by Barry Fuller (AFC Wimbledon). Foul by Ryan Sweeney (AFC Wimbledon). Billy Kee (Accrington Stanley) wins a free kick on the right wing. Tom Elliott (AFC Wimbledon) is shown the yellow card for a bad foul. Foul by Tom Elliott (AFC Wimbledon). Seamus Conneely (Accrington Stanley) wins a free kick in the defensive half. Attempt missed. Andy Barcham (AFC Wimbledon) right footed shot from the left side of the box is close, but misses to the right. Attempt saved. Piero Mingoia (Accrington Stanley) right footed shot from outside the box is saved in the top centre of the goal. Attempt missed. Sean McConville (Accrington Stanley) right footed shot from outside the box is close, but misses the top left corner from a direct free kick. Substitution, AFC Wimbledon. Sean Rigg replaces George Francomb because of an injury. Foul by Connor Smith (AFC Wimbledon).